Jeff Winkler, CEO of Origin Code Academy, stands on a balcony at the company’s new office in DiamondView East Village, a 15-story office tower next to Petco Park. Photo by Jamie Scott Lytle. San Diego  School can be stressful. For professionals looking to switch careers in a matter of months to a new job requiring new technical skill, it can be overwhelming. “In the first two weeks of the program, I would always have at least one person cry in my office,” said Jeff Winkler, founder of Origin Code Academy, a San Diego-based coding school. That was before Winkler revamped the program by “flipping the classroom,” as it’s known in education; moving from traditional lecture-based learning to a digital curriculum bolstered by instructors when needed. He also decided to make start dates and end dates more flexible, to account for life’s inevitable hiccups. Winkler, who launched the company in 2015, said he noticed the 12-week schedule through which coursework was offered over the first two years was adding to students’ stress levels, and making the program unworkable for some because of the period between start dates. “When you’re under that much stress, your learning capability goes close to zero,” Winkler said. 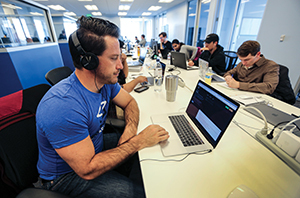 Coding boot camps aren’t new, but some entrants into the market have struggled. Dev Bootcamp, a pioneer of the genre, launched in San Francisco in 2012. Test-preparation course maker Kaplan bought the company a few years later, pledging expansion. A San Diego office, opened in 2015, was part of that expansion. But the company closed in 2017, citing financial difficulties. So did Iron Yard, which was founded in Greenville, South Carolina, in 2013, and expanded — with backing from the Apollo Education Group, which owns the University of Phoenix — to campuses across the country. San Diego has significantly fewer coding companies than other major cities. Origin Code and Learn Academy are the largest locally based for-profit coding schools. UCSD’s Extension recently launched its own coding school; there’s also SoftStack Factory, a nonprofit organization. Tuition at Origin Code is $13,500. Learn Academy charges $12,500 for its course, which includes a guaranteed one-month internship following its three-month program; it also has a $499 weekend-long course. Winkler said the trick to success — his company is profitable, although he declined to disclose revenue — lies not primarily in attracting students, as the demand for tech talent is taking care of that, but in finding the right teachers. Nearly all students at Origin are career changers, age 25 to 35, inspired to learn new skills and increase their long-term earning potential, Winkler said. Nearly 120 have gone through the program so far; 98 have subsequently landed jobs.